Now that you have decided to use ExoShield Wood Deck stain, let’s discuss the most effective methods to achieve optimal results. Follow the below steps for proper surface preparation before applying ExoShield Wood Deck stain to your deck. Start the surface preparation by cleaning the deck boards. This will remove of all the grime, dust and mildew that exists. The goal is to apply ExoShield stain to clean, fresh and bright wood – as close to the original color as possible. Applying ExoShield over gray weathered wood will just seal in the undesirable color and weathered appearance. 1. The first optional step is using wood cleaners and brighteners – these can help but are rarely enough on their own unless you are starting with practically new wood. 2. Pressure washing is the key step in properly preparing your deck for ExoShield wood stain. We almost always recommend pressure washing. 3. The final optional step is sanding which is usually only necessary in extreme cases. Wood cleaners and wood brighteners are separate components but are applied in a similar manner. They come in a powder form and should be mixed with water in a 5 gallon pail or garden sprayer, according to the manufacturer's directions. When using these wood cleaners and brighteners, allow them to fully soak into the wood, keeping the surface wet while the cleaner and brightener are doing their job. After about 15 minutes, fully scrub the deck with a stiff bristle brush, again keeping the surface wet; then, finally, rinse off the deck. It could take up to 2 or 3 applications of each component to get the dirt and mildew out of the wood. Generally speaking, wood cleaners and brighteners will help make the rest of the job easier, but they are a lot of work for minimal improvement in our opinion. If you are satisfied with the appearance of the wood after using the wood cleaners and brighteners, then pressure washing is not necessary and you can go straight to applying ExoShield once the deck has had enough time to dry out, usually a minimum of 48 hours. In most cases, pressure washing the wood is necessary to fully clean the wood fibers. You must use extreme caution when pressure washing softwoods such as Cedar, Redwood and Pine since these species of wood are much softer than typical hardwoods. We recommend a fan nozzle, as opposed to a needle-point turbo nozzle, and a maximum pressure of no more than 2,000 psi. Be sure to test a small section of the deck before just blasting the whole area. Damaging the wood fibers is very easy and can’t be remedied. For hardwoods such as Ipe, Batu, Red Balau, Cumaru, Garapa, Massaranduba and other similar dense species of wood, we recommend using a turbo nozzle. The turbo nozzle allows you to clean the wood as quickly as possible, without sanding, getting the wood back to its original color in short order. The turbo nozzle on the pressure washer is strong enough to get into the wood fibers, deep cleaning the wood fibers enough to restore that fresh and bright, original wood color. We recommend a pressure range from 3,000 psi to 4,000 psi but please be careful! Never hover over one section of the deck and always keep a sufficient distance between the turbo nozzle tip and the wood itself. Keep the tip of the pressure washer moving at all times or you risk cutting right into the wood fibers. For medium density hardwoods such as Meranti, Cambara and Genuine Mahogany, the maximum pressure should be under 3000 psi and be especially cautious on older decks that may have signs of rot or decay. This is also true for softwood decks – older decks will most likely have some rot or decay and you will need to be very careful if you decide to pressure wash.
Because finding the proper pressure to clean while maintaining the integrity of the wood can be difficult in many cases, we recommend you err on the side of caution, lightly pressure washing, followed by sanding the wood until the original wood color is clearly visible. If you aren’t 100% satisfied with the appearance of your deck before finishing, you can certainly repeat the preparation steps. After you finish pressure washing and or cleaning with other methods, let the wood dry for a minimum of 48 hours; but for best results, we recommend four days of dry weather. Finishing your wood when the weather is dry is absolutely necessary; if it does rain right after finishing your deck with ExoShield, wipe off the deck immediately and keep it as dry as possible; and then wait for dry weather. A light top coat should be all that you need to remove any water spots. As a final and optional step, sanding your deck before finishing with ExoShield has several advantages. Pressure washing will generally raise the grain and leave a rough surface so sanding is prefect final step to give you the smoothest possible surface. 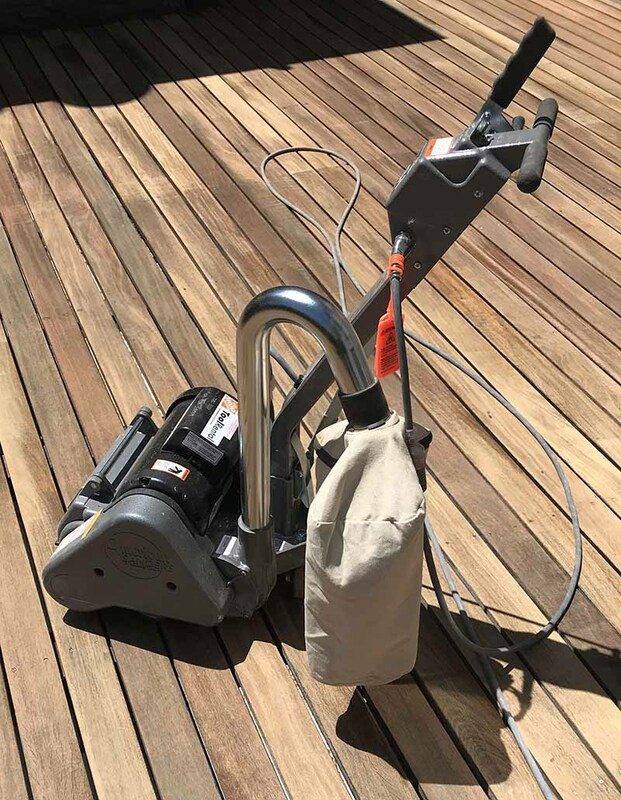 If you decide to skip pressure washing and want to bring the deck back to original wood, sanding with a wide belt drum sander can help you get there in the fastest manner possible. We’ve used grits as low 24 on a wide belt sander and then finished it off with an 80 grit belt so the wood doesn’t end up too rough. For a light sanding, a hand-held random orbital sander works ok but you should expect to do only 100 SF per hour; a large deck will take all day or longer! If you’re trying to remove significant weathering, a hand-held belt sander will work better than a random orbital. To get the job done quickly, a wide belt flooring sander can probably sand close to 800 SF per hour! We’ll be writing another article soon on exactly how to apply ExoShield wood stain. If you can’t wait for the next blog article, please visit www.novausawood.com/exoshield or give us a call. Nova USA Wood Products provide premium hardwood flooring and decking stain. Our ExoShield premium wood stain is the highest quality wood stain ever produced. ExoShield provides superior protection for exterior wood applications such as decking, siding, and outdoor furniture. Our product is guaranteed to look good for at least two years, and instead of getting the whole deck sanded and pressure washed for another finish, you simply have to recoat it with our ExoShield stain. Give us a call today at 503-419-6407 or visit our website for more information! please be respectful of others' opinions and do not use profanity. comments may be edited for objectionable content.